Once downplayed, Russia is now focusing on training future drone operators at the center for unmanned aerial vehicle (Bezpilotniy Letayuschiy Apparat, or BPLA) in Kolomna. The Russian Ministry of Defense has opened a new center to train unmanned aerial vehicle operators as part of a broad goal of getting the country’s drones up and running to enhance the country’s military forces. 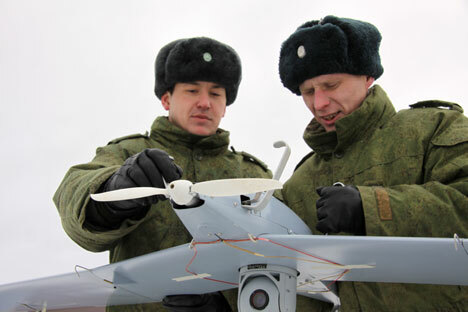 The joint armed forces’ Bezpilotniy Letayuschiy Apparat, or BPLA, (unmanned aerial vehicle) is located in a Moscow suburb on the base of the Kolomna Higher Military Artillery Command College. The former college was disbanded in 2008, and prior to the Revolution this was the site of the Mikhaylovsk Artillery College, founded during the reign of Catherine the Great. Despite the fact that the campus has not had any serious cosmetic repairs recently, the head of the center, Valeriy Frolov, is full of optimism A fundamental restructure is due to begin at the center at the end of the year, with several new classrooms to be built for lectures. In 2015 the center will have a fleet of BPLAs of various types, and a range will be developed in 2016 where students and instructors from the joint-service center will be able to learn how to fly BPLAs and practice how to control them in flight. Students will include junior aviation specialists from dedicated BPLA squadrons, which are now a part of all mechanized infantry and armored combat units in Russia’s land forces. Colonel Frolov explained how his center has been through 16 modernizations in recent years. According to him this was linked to Army leadership underestimating the significance of using unmanned aircraft in a real combat situation. It even reached a point where unmanned aerial vehicles were being manufactured in the training units where tank crews would be trained. Even the war with Georgia in 2008 failed to draw attention to BPLAs. Troops in Tbilisi used BPLAs actively during the war with Georgia for reconnaissance and to guide their artillery onto targets, while the Russian Army was forced to use heavy Ty-22R reconnaissance aircraft. One of these aircraft was even shot down by the Georgians and the captain’s body is still missing. Only after Sergey Shoygu became Minister for Defense was the training of BPLA operators taken seriously. Now general headquarters and a special directorate is in charge of training operators of unmanned aircraft, procurement of BPLAs themselves and of developing tactics, as well as modes and methods of operation. This work is headed by Major-General Aleksandr Novikov. New weaponry and combat technology has begun to arrive at the center, and 70 graduates of Gagarin and Zhukovskiy Air Force Academies were sent to Kolomna to serve as lecturers and instructors for future students. They will receive special training, as they would not have been taught how to fly unmanned aerial vehicles at their academies. Senior Warrant Officer Aleksey Naraykin came to Kolomna from Gusev in the Kaliningrad region. He is serving in a Marines unit and has been in the Army for 17 years, and has taken part in many exercises and combat operations. He understands how important it is for a commander at any level to have reliable and accurate information concerning an enemy. He said he was enthusiastic about assimilating what was for him a new specialization - an unmanned aerial vehicle operator. Junior Sergeant Vitaliy Koluntayev is from the same squadron in the Baltic Fleet’s Marine BPLA brigade. He has been in the Army for eight years and said he enjoys working as a BPLA operator. He also likes the way the lecturers explain quite a difficult subject in a simple and straightforward way. The most important thing though is that they are a mixture of experienced officers as well as very young soldiers, like Koluntayev. A two-week test of their abilities allows the academy to identify which students are able to become operators. “Those that stay with us undergo a full training program over the course of almost three months. After this they have to pass written tests and receive a certificate on conclusion of their studies, as well as a package for further work. They are then sent back to their units to resume their service,” Frolov said. By the end of 2013, around 800 servicemen from BPLA squadrons will have trained at the center, he said.